Game Day Chili Go BOOM! Some Americans have already started building their Snackadiums. I mean, c’mon. Those things have gotta take some time. Well, maybe you’ve procrastinated on your Super Bowl snack planning. Don’t worry, you’re not completely un-American. Also fortunately, there’s Game Day Chili. 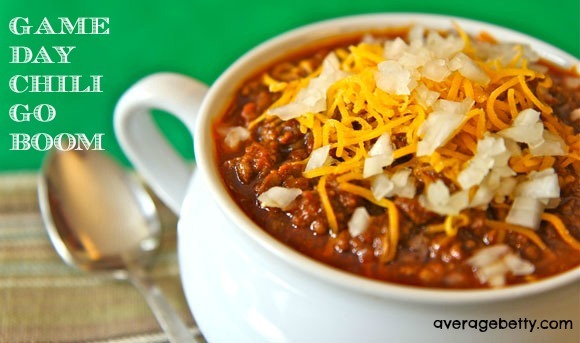 This spicy beef chili is quick and easy and can be cooked up the morning of the Big Game. Of course it’s great all by itself, or as the crowning glory of a Chili Dog. 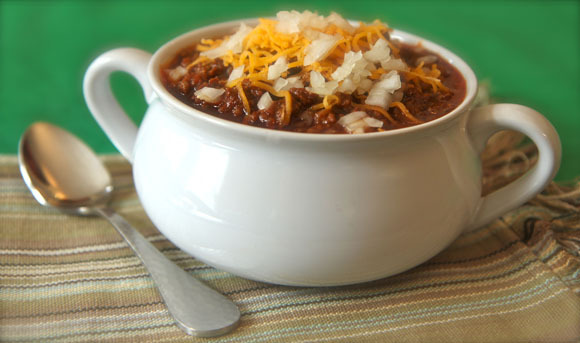 If you really want to see some smiles, serve up Game Day Chili as a Frito Pie – AKA – Walking Taco. WATCH THE VIDEO! Makes 6 cups chili. All chili powders vary, taste and adjust spices to your taste. For even more spice, add some of the membrane and seeds from the jalapeno. I used an 80/20 ground beef. Use other ground meats to suit your taste. 1) In a large pot over medium heat, cook bacon bits until crisp. Remove from pot, drain bits on a paper towel and set aside. 2) To the pot add diced onion and jalapeno and saute until tender. Season with salt and pepper. 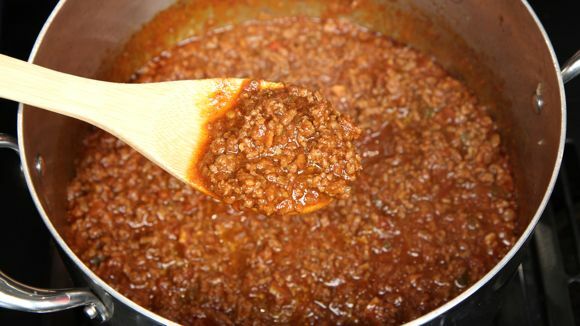 3) Add the ground beef and cook over medium-high heat until browned well. 4) Turn down the heat and add garlic, chili powder, cumin, cayenne and smoked paprika. Stir well. 5) Add back the bacon bits. 6) Add beef broth and crushed tomatoes. 7) Add Worcestershire sauce and molasses. 8) Stir and taste for seasoning. 9) Cover and simmer over low heat at least 30 minutes, but the longer the better. 10) Serve piping hot with toppings of your choice. Have YOU subscribed to my channel on YouTube?